A promising design, but with unproven safety record so don't copy this yet. 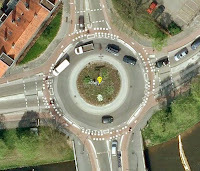 This roundabout is interesting because it combines the safe layout of the proven safest Dutch roundabout design with priority for cyclists at the crossings, when similar layouts have previously only been used where drivers are given priority at the crossings. Extra care has been taken in the design to try to ensure cyclist safety at these priority crossings - a factor which has been proven in the past to lead to a sharp reduction in safety. A particularly poor "with priority"
Frequent injuries at this location. It slows both cyclists (by tight corner radii) and drivers (by use of narrow lanes with raised tables), giving both more time to react at the crossing. Good sight lines are ensured because cyclists and drivers cross at right angles to one another. 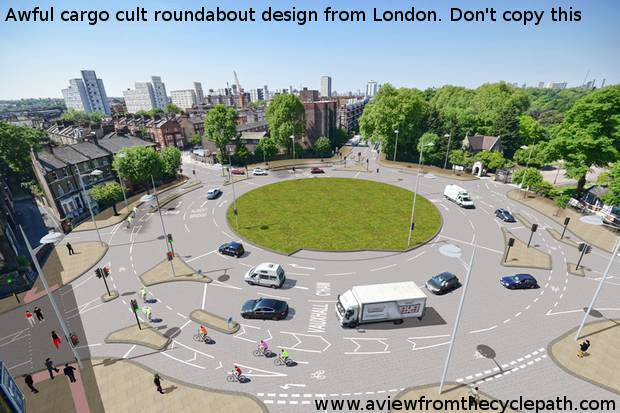 While turbo-roundabouts require multiple lanes, this design keeps the cycle crossings far enough from the roundabout that cyclists are required to cross only one lane of motor vehicles at a time. A generously sized safe refuge is provided between the two streams of traffic. The crossings being placed at a considerable distance from the roundabout itself means that the moment in time when drivers negotiate with cyclists on the crossing is distinctly different from that when they have to negotiate with other drivers on the roundabout. I think there is great promise in this design but I must sound a note of caution. they resemble less successful crossings. The distance between the crossings and the roundabout is quite large, but for drivers entering the roundabout the distance between the crossing and the point where they need to choose a lane is very short. This may distract drivers such that they are less likely to notice cyclists. Raised tables on straight roads have only a slight effect of slowing drivers. When I looked at three different priority crossings a few days ago, the crossings where drivers were effectively slowed had more measures than just a raised table and the example which barely slowed drivers at all looked very much like these crossings. This isn't the first time that priority has been combined with a layout which provides better sight-lines. For example, one attempt to design a roundabout in Eindhoven combining good sight-lines with cyclist priority resulted in some injuries. I remain hopeful about this design, but we must keep in mind that it is an experiment. Without experimentation we can never discover new and perhaps better ways of doing things. 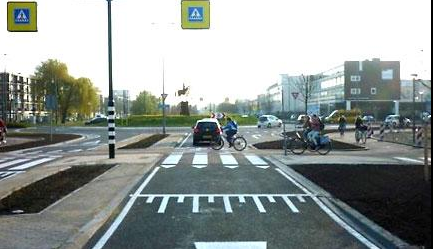 The Netherlands leads the world in cycling infrastructure design, and experimentation continues here. This is a good thing. But ideas should only be adopted more widely if they have been proven to work safely and efficiently. Experiments which didn't work out so well include an experimental cycle-path surface which was installed near Assen in 2009, but then replaced again in 2013 after it had proven not to provide an adequately comfortable surface for cycling. There was also the Zwolle "fietsrotonde" for which bold claims were made in advance, but where poor design caused injuries within months of opening. As of right now, there is precisely one roundabout of this new design in the world. It should be viewed as a brave and worthwhile experiment and it may eventually form the basis for yet safer conditions for cyclists in the Netherlands, but it should not yet form the basis for other experimentation elsewhere. We do not yet have long term accident statistics for this design and it is premature to make any claim about whether or not this new design is in fact safe. Note also that the new design requires a very large footprint in order to provide the required sight-lines and space for the lanes of the turbo roundabout. As such, it's unlikely to be able to be applied everywhere. This design provides the best basis for emulation elsewhere. Such roundabouts have the the best safety record within the Netherlands and are likely to remain safe even if aspects of the design are compromised. The safest design currently in use in the Netherlands, shown in this photo, places the emphasis on cyclists to look after their own safety rather than relying upon perfect driver behaviour to keep cyclists safe. This is one of the reasons why this design is successful. The same principles have also been shown to work on similarly designed roundabouts with considerably smaller footprints. The details of any design are important. 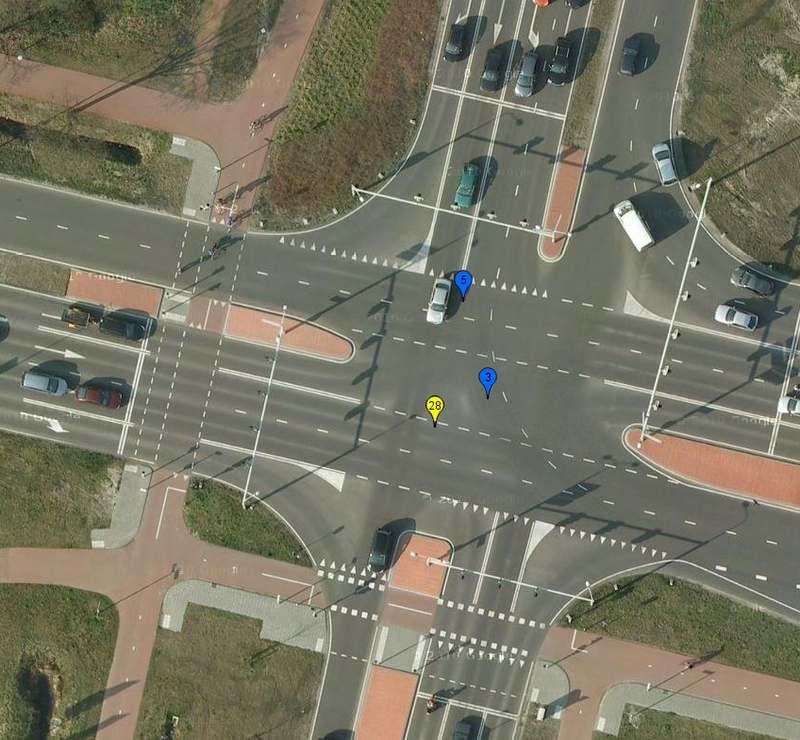 Distance between roundabouts and crossings, heights of raised tables, lane widths, road camber, geometry are all important and none of these should be taken as being the sole reason why Dutch roundabout designs are safe for cyclists. 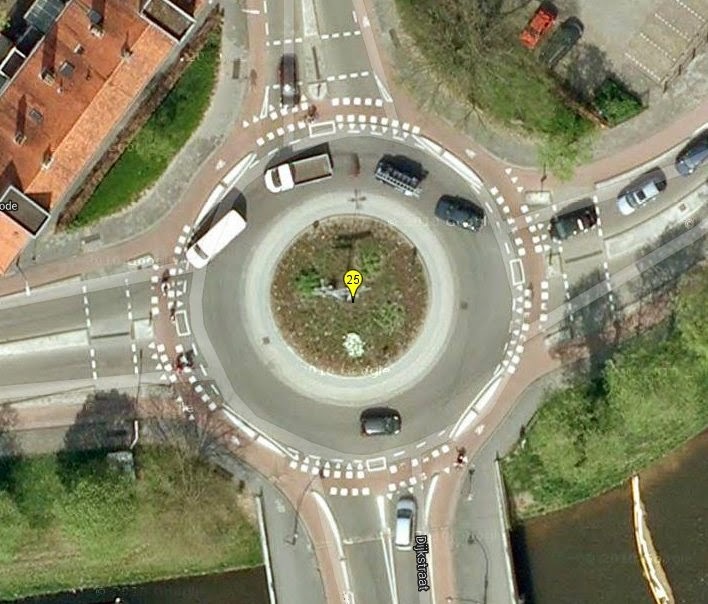 It should also be noted that roundabouts are only used by cyclists in the Netherlands where traffic volumes and speeds are relatively low and are controlled. 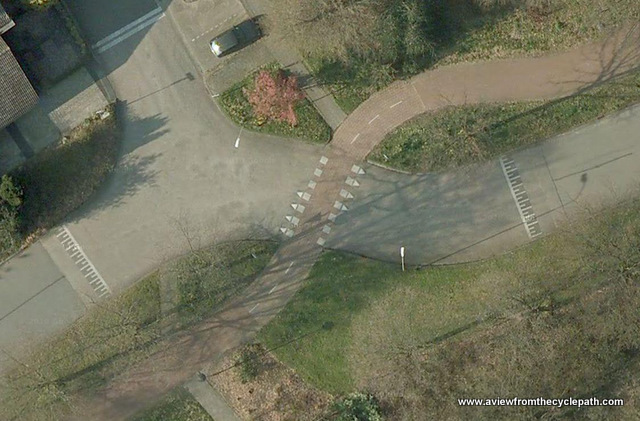 Unfortunately, it is not uncommon for designers elsewhere to completely misunderstand how Dutch roundabouts achieve their safety. 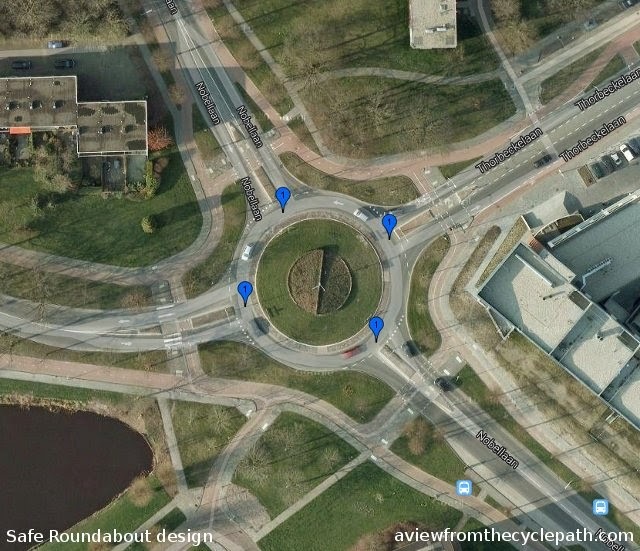 "Cargo-cult" style copies of Dutch roundabouts built in the UK in Bedford, Cambridge and York without the safety features of the Dutch roundabouts which provided inspiration and as a result they are not so safe. In order to try to assist planners and campaigners alike to make the right choices, we offer cycling study tours which take a unique, independent, view of Dutch cycling infrastructure and which explain everything in plain (native) English. Book a place to discover more about what works well and should inspire new infrastructure design elsewhere as well as what works less well and should not be copied. Find out how how things really work in the Netherlands before trying to copy anything. I've covered several types of road crossing for cyclists in the past. Those with traffic lights, where cyclists have to wait for motorists but can stop in the middle of the road, those where there is equal priority between cyclists and motorists. Sometimes it's possible to give cyclist priority over roads when cycle-paths and roads cross but this can only be safely achieved if certain conditions are met. It is not enough simply to put up a give-way (yield) sign and expect that drivers will obey it. Driver behaviour is more effectively controlled by road layout than by signs or speed limits. In order for it to be safe to give cyclists priority at a crossing, the speed of cars on the road needs to be controlled and traffic volumes need to be low. The junction needs to be designed such that it gives obvious visual priority to cyclists, and sight lines need to be good enough that drivers and cyclists can see each other and respond accordingly. This is not the same concept as "making eye contact". If people driving and cycling are surprised by the other party because they cannot see them in time then they are less likely to be able to respond safely. First example in the video. Cycle priority crossing of a minor road. 30 km/h speed limit on the road, raised table starts 20 m and 14 m away from the crossing. Bend in road naturally slows cars. The cycle-path is three metres wide and runs at a distance of six metres from the parallel road. Second example. This road has a 30 km/h speed limit, but it is a much busier road than the other two, providing a route by car to local shops and other facilities. Raised table starts 5 m and 12.6 m from the cycle crossing. Bend in road naturally slows cars. Cycle-path is 3.5 m wide and runs perpendicular to the road. Third example. 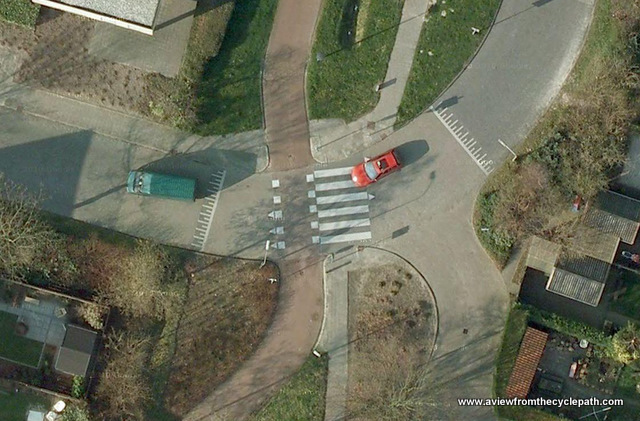 The raised table almost doesn't exist in this case and there is no bend in the road so drivers pass over this crossing at far higher speeds than the other two. Note how drivers may not be able to see cyclists coming from North or South until they are close to the crossing due to being obscured by buildings and vegetation and then there is a chance that a driver will misinterpret the intentions of a cyclist so not slow down for them. Note also how the curves on cycle-paths, especially North of the crossing, are far less helpful for cyclists than the other two examples. 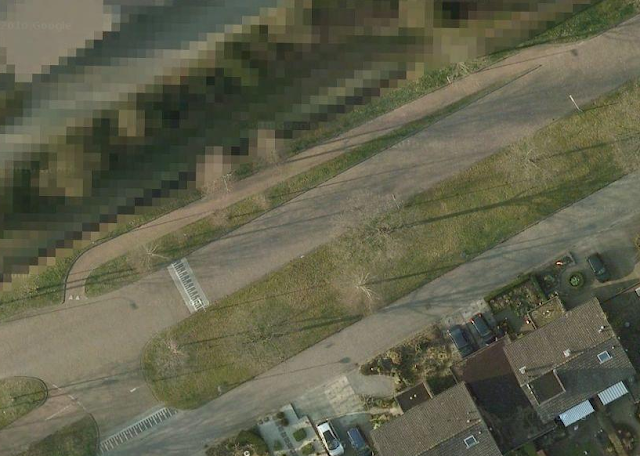 Cycle-path is 3 m wide and at the point of the turn it's just 3 m from the parallel road. While the third example is the one which I believe is least satisfactory (see the video for why), collisions between cars and bikes are only recorded as having happened at the second example. There is a rational explanation for this. The second example is located adjacent to the local facilities of a suburb (shops / doctor / health / church) and this results in considerably more cycle and car traffic than the other two which located within residential streets. Three collisions with cyclists occurred over the 2007-2012 period at the second example, one of which caused an injury. Note that this refers to cycle-paths having a design speed of 30 km/h. Cycle facilities should not be designed to slow cyclists, but to enable efficient cycling. The first two examples above conform to this recommendation, while the third, especially when approached from the east, does not. This causes a problem for cyclists and motorists. CROW recommended visibility at crossings by road width (crossing distance) and speed. The requirement for approach visibility should also be noted. Take into account that these speeds are 85th percentile speeds in actual use, not merely the posted speed limit, and that the required sight lines more than double in length for any crossing of a 50 km/h road vs. a 30 km/h road. Also note that wide roads require more visibility than narrow roads because crossing times are longer. All the roads shown in the above examples are under 7 m in width and in all those cases there is a 30 km/h speed limit so sight lines of about 50 m in length are required. All three examples include additional measures to control speed. In the first example, the posted speed limit and additional measures are adequate for a 50 m sight line. In the second example they are marginal (though helped enormously by the curve in the cycle-path which places cyclists in a more visible position and the curve in the road which slows drivers). The third example does not meet the requirements because the speed of cars is excessive and the sight-lines are not long enough. Related: Note that it has been understood for many years in the Netherlands that posting a lower speed limit is not enough to ensure lower speeds. It is very difficult to successfully retrofit crossings of this type because existing streets are often too straight, existing paths often not visible enough. 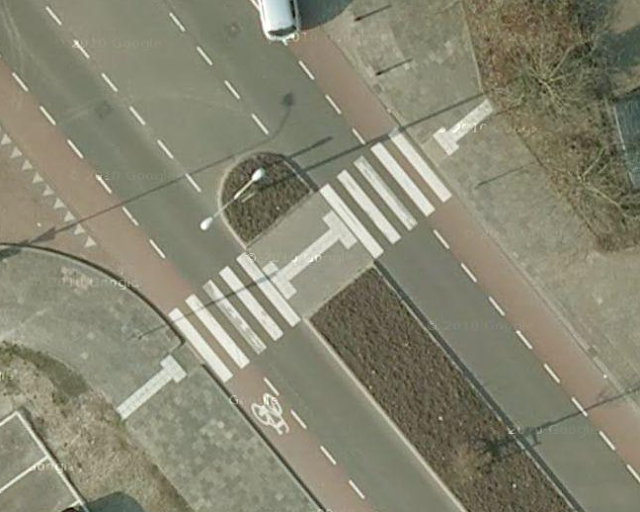 While cycle priority crossings are fairly unusual in the Netherlands, retro-fitted cycle priority crossings are even more rare. 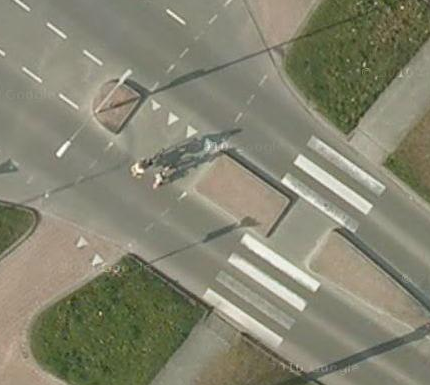 All the examples of priority junctions in Assen were designed as integral parts of the road design. Those used as examples in the video and images above date from when those parts of Assen were designed and built in the late 1970s through to the 1980s. People sometimes ask why cyclists are not given permission to cross with priority on all pedestrian priority (zebra) crossings. There are good reasons why this should not be so. In many locations, it would be difficult for a cyclist to be The risk of a cyclist emerging quickly from behind a building or because there are inadequate sight lines. Cyclists are much faster than pedestrians and they require space in order to make a turn. This crossing of a busy road gives priority for pedestrians over both cyclists and drivers. 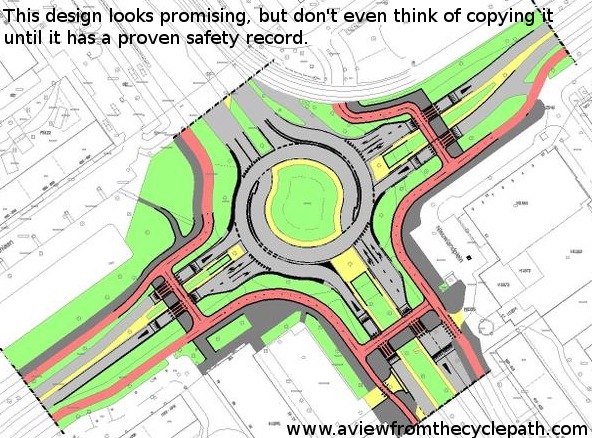 but there is no place within this layout to provide a safe priority cycle crossing. 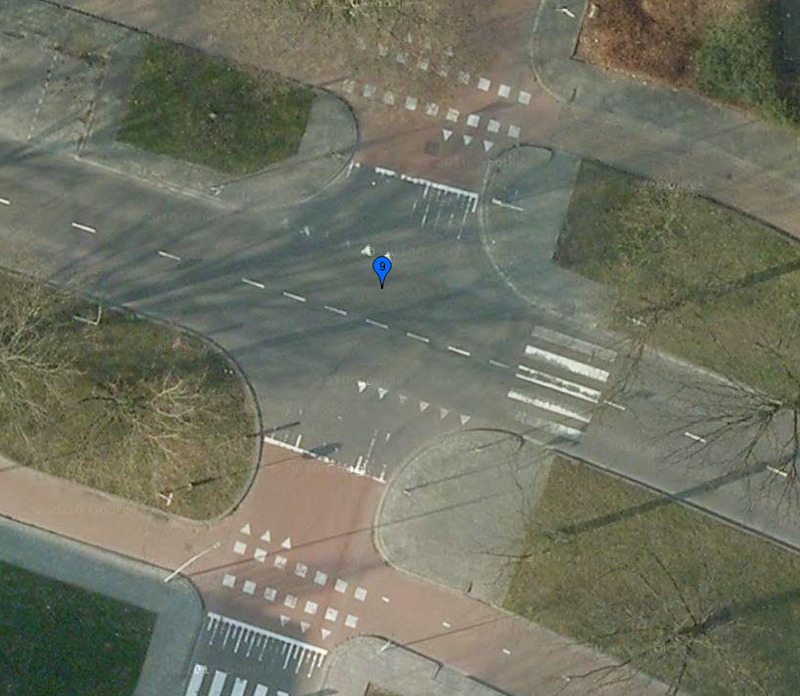 In any case, any cycle crossing would be better slightly further North on desire lines. This location has a parallel cycle and pedestrian crossing. Pedestrians have priority while cyclists do not. This is a relatively busy through route for cars with a 50 km/h speed limit. As a result a cyclist emerging at speed from the side roads may appear in front of a driver before the driver has had an adequate chance to response and therefore there is too high a chance that a driver won't stop in time. But they have much more time to react to a pedestrian due to the slower speed of pedestrians. In this location cyclists have priority over side road crossings which are parallel with the main road. These roads have 30 km/h speed limits and speeds are further reduced by the junction, the small corner radii and the raised tables. However only pedestrians have been priority over the 50 km/h main road. At a very large busy junction, this example joining the 70 km/h ring road to a 50 km/h main route out of the city, neither cyclists nor pedestrians are given priority over motor traffic in any direction. On a road like this with many lanes of traffic, higher speeds and much to look out for it would be dangerous to give priority to cyclists or pedestrians. This junction is too large and busy to be a "protected intersection". While it could have seen implementation of a simultaneous green junction, instead there is a more conventional traffic light junction here next to which cycle path green lights are synchronized with motor vehicle red lights where conflicts would otherwise occur. Priority can be given for cyclists and pedestrians by other means. In other locations in Assen this is done by use of tunnels and very quick reacting light controlled crossings. Two cyclists were injured here. One due to a single sided collision with street furniture, the other due to ignoring a red light. A possible solution which people sometimes think of to the problem of turning across traffic is the hook turn. We have precisely one example of this in Assen. It's a relic from the past which has somehow survived on a quiet residential street and it's shown in the photo below. Note that the hook starts with a cycle-path in the top right hand corner of the image and continues more than 60 metres to the junction which it serves in order that it could provide a gradual enough transition for cyclists. The crossing is then assisted by a large raised table. Despite all of this, it's actually quite awkward to use. It perhaps made a little more sense decades ago when this was a busier route, but it certainly doesn't help in this situation now. I don't recommend this type of infrastructure. A generously proportioned 60 metre long hook turn assisted by a raised table. But it's still awkward to use. The Alternative Department of Transport blog recently coined the phrase "visual priority" to refer to where priority at a crossing is indicated by the design of the street and not merely by signs. The red surfacing continuing through each of the junctions shown in the video at the top of this blog post is a good example. I like this term, it's concise and obvious, so I have used it too. 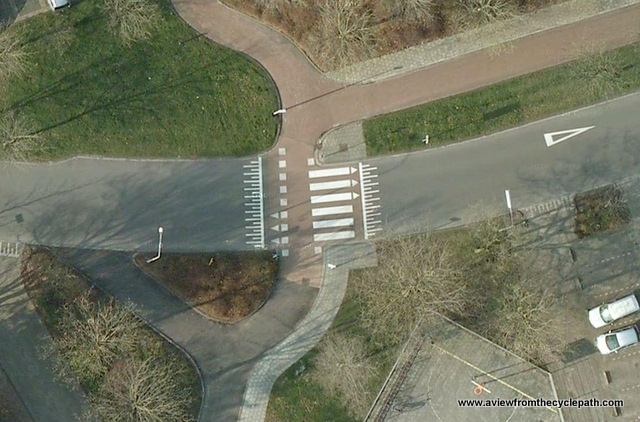 Most examples of crossings in the Netherlands benefit from good visual priority. Of course, good visual priority is only one factor. In itself it is no guarantee of success. As you will see from the video, the third example of a junction with a short raised table which coincides only with the crossing itself is not successful at slowing cars even though the visual priority is good. Junctions must also encourage safe behaviour by other means, such as use of bends on roads and level changes using a raised tables to slow drivers, bends on cycle-paths to improve sight lines, and we must of course realise that there is no one-size-fits-all solution. The majority of junctions are not suitable for a cycle priority treatment for reasons of sight-line or traffic speeds and volumes. It's not possible to completely understand infrastructure like this from reading blog posts and watching youtube videos. On our study tours we demonstrate real life examples.